Veterans are using Whisper to share the most intimate details of their struggles with post-traumatic stress disorder. *NOTE: This article was published soon after the latest shooting at Army Base Fort Hood in Texas. 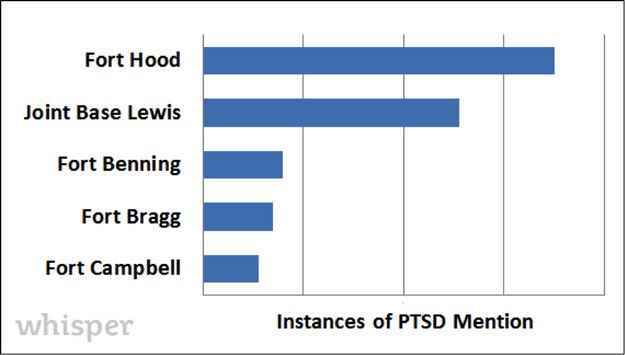 The shooting at Fort Hood earlier this month reignited an important national conversation concerning the prevalence of post-traumatic stress disorder (PTSD) among military veterans — particularly those who have seen firsthand the true nature of combat. For the tens of thousands of current and former service members who have turned to Whisper to find like-minded individuals with similar experiences with whom to commiserate, that conversation didn’t require reignition. Whisper protects its users’ anonymity by never requesting any type of personally identifiable information, meaning that users’ identities remain entirely unknown — and unknowable — to other users. That anonymity provides vets with the sense of security they need to have a frank and open dialog about taboo subject matters such as guilt, emotional conflict, and the internal war that remains long after the external battles have ended. This chart is clearly telling, but charts can only tell us so much. To truly understand the trouble with PTSD, it’s necessary to talk about it with someone who truly understands: veterans with PTSD. Using Whisper’s anonymous messaging platform, I reached out to several current and former service members who had been using Whisper to discuss their ongoing struggles with PTSD, its symptoms, and its life-altering side effects. Following are some of the invaluable lessons they taught us. Whisper obtained consent from all users mentioned below to share their stories publicly. It could be something as simple as a movie or a sudden loud noise,” noted user John Doe [real username redacted], a marine based out of Camp Lejeune in North Carolina. John Doe served nine months in Afghanistan and saw his best friend die in his arms after being shot in the neck 250 miles from the nearest medical facility.